“Sponsored Post” When it comes to buying a brand-new car for the family you need to take your time because there are so many things to consider. Yes, most people will initially focus on the price of the brand-new car. But the price should be something you think about while you thoroughly investigate different vehicles, along with the associated costs. We purchased our last brand-new car just over 19 months ago. Today I want to share with you the 20 different things that we took into consideration before buying. Depreciation value is so important to me because I know that in several years I will probably want to sell this new car. And, of course I will want to get a good dollar for it. You can easily do research online these days to learn more about depreciation value. The cost of insurance for a brand-new car is typically quite higher than a used car. As you get closer to deciding, double check the cost of insurance with your insurance broker, and make sure you can fit that cost into your current budget. This year it seems every time we go out the price of gas has risen. And not just a penny or so. On Sunday most gas stations were charging 10 cents more than they were a week ago. Make sure your new car gets good gas mileage or you may find that you can’t afford to drive it. New cars offer different options these days when it comes to seating capacity. If you are buying a brand-new car for the family, then you will want to ensure that there is enough room in the vehicle for everyone. Consider how many adults and children will be in the car at the same time. Is there enough leg room for each person? And, if any of your children require a car seat, make sure that there is room to safely install a car seat, based on the size of your child. Towing capacity is important if you ever plan to tow a trailer, either for work or for family trips. Look inside the new car and consider how you will fit in everything you need for your family. School back packs, laptops and brief cases, sporting equipment, baby diaper bags, suitcases, a cooler, etc. Make sure you will have enough room, so that you are not struggling each day when it is time to leave the house. Do you attend many activities within your city, or do many road trips? A roof rack is important for families that go skiing or travel, and need an extra place to safely store equipment or luggage. Many brand-new cars have cameras to assist the driver. These cameras help the driver see what is behind them, and what is beside them. Check for GPS maps, ease of use when it comes to lights, switches for entertainment, plugs for your cell phone, etc. Maintenance is a huge consideration, because depending on the type of car you buy, the costs for regular maintenance can add up quickly. Even the price of a simple oil change can be very expensive, depending on the type of car you buy. Ask for a list of the cost of all the items that require maintenance so that you know what to expect. As well, if you plan to take your new car to the dealership for service and maintenance, then prior to buying, ask to speak to the service manager. Try to get a good feel for their customer service abilities, response time and accuracy. Most new vehicles have keyless entry. As long as you have the actual key fob in your pocket or your purse, you will be able to unlock the car when you are standing beside it. The cost of snow tires is important to us because we live in the north, and this year we will be buying them. We are probably looking at close to $1,000 to buy them and have them installed for about 5 months. When you are reviewing your budget for your new car, you want to remember this, so unlike us, you are not having to figure out how to pay for those come fall. For us, having a radio, a CD player, and being able to connect one of our cell phones for music is good enough. But many families go on long trips and they want entertainment centers to keep their children busy. Consider your options, and what you and your kids will enjoy using. The brand-new car may be perfect for you, but what is the car dealer like? Do they offer stellar customer service, or are they simply in a hurry to make a sale? Read reviews so that you can decide who you want to deal with. Visit dealerships and speak to the sales people. Take your time, and find someone you feel comfortable with. Read automobile magazines and car websites to find as much information as you can about the manufacturer of the car that you want to buy. Where are their cars manufactured, etc. The salesperson at the car dealership should be able to review the new car warranty with you. Ask lots of questions. See if there is an option to extend the warranty, and if yes, how much will that cost. When traveling with your family you want to know that should anything happen, such as a mechanical failure or an accident, that you will have instant access to assistance. With a roadside assistance program, you call one number and they find a local tow truck and send them to you. You always want to test drive a car before you buy it. You are checking for things such as comfort, safety, ease of use, and so much more. Test the brakes, test the acceleration. See if you feel comfortable in the seats. Check head room, etc. Even a brand-new car can already have a history for recalls. Ask the salesperson if there have already been recalls. What were they for, and how quickly were they dealt with by their service department. 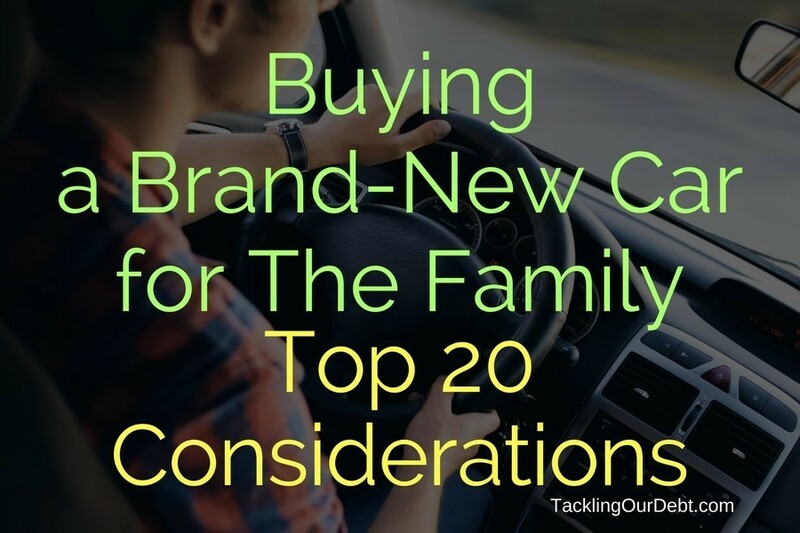 Is the price of the brand-new car for the family your first consideration or your last one? Of course, the price is important. There is no sense looking at an expensive luxury vehicle if you are living on a frugal budget. So the price is always in the back of your mind, as you visit car dealers, do your homework, and consider all of the above items. Begin by shopping for what you can afford. And then ensure that what you can afford meets all of your requirements and considerations.